Last week had a whole bundle and a half of mathematically-themed comics so let me finish off the set. Also let me refresh my appeal for words for my End Of 2016 Mathematics A To Z. There’s all sorts of letters not yet claimed; please think of a mathematical term and request it! David L Hoyt and Jeff Knurek’s Jumble for the 19th gives us a chance to do some word puzzle games again. 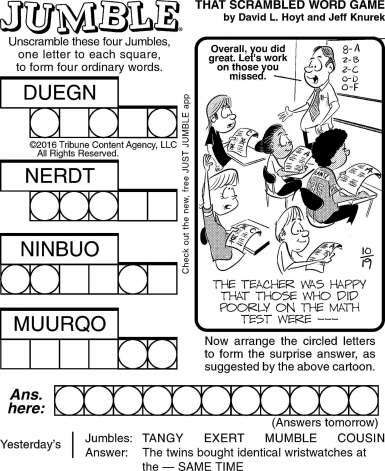 If you like getting the big answer without doing the individual words then pay attention to the blackboard in the comic. Just saying. David L Hoyt and Jeff Knurek’s Jumble for the 19th of October, 2016. The link will probably expire in about a month. Have to say, it’s not a big class. I’m not surprised the students are doing well. Patrick J Marran’s Francis for the 20th features origami, as well as some of the more famous polyhedrons. The study of what shapes you can make from a flat sheet by origami processes — just folding, no cutting — is a neat one. Apparently origami geometry can be built out of seven axioms. I’m delighted to learn that the axioms were laid out as recently as 1992, with the exception of one that went unnoticed until 2002. Gabby describes her shape as an isocahedron, which must be a typo. We all make them. There’s icosahedrons which look like that figure and I’ve certainly slipped consonants around that way. I’m surprised and delighted to find there are ways to make an origami icosahedron. Her figure doesn’t look much like the origami icosahedron of those instructions, but there are many icosahedrons. The name just means there are 20 faces to the polyhedron so there’s a lot of room for variants. If you were wondering, yes, the Francis of the title is meant to be the Pope. It’s kind of a Pope Francis fan comic. I cannot explain this phenomenon. Rick Detorie’s One Big Happy rerun for the 21st retells one of the standard jokes you can always make about fractions. Fortunately it uses that only as part of the setup, which shows off why I’ve long liked Detorie’s work. Good cartoonists — good writers — take a stock joke and add something to make it fit their characters. I’ve featured Richard Thompson’s Poor Richard’s Almanac rerun from the 21st before. I’ll surely feature it again. I just like Richard Thompson art like this. This is my dubious inclusion of the essay. In “What’s New At The Zoo” he tosses off a mention of chimpanzees now typing at 120 words per minute. 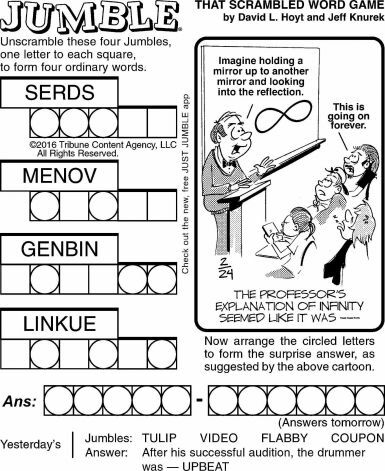 A comic reference to the famous thought experiment of a monkey, or a hundred monkeys, or infinitely many monkeys given typewriters and time to write all the works of literature? Maybe. Or it might just be that it’s a funny idea. It is, of course. Rick Kirkman and Jerry Scott’s Baby Blues for the 22nd of October, 2016. I’m not quite curious enough to look, but do wonder how far into the comments you have to go before someone slags on the Common Core. But then I would say if Hammy were to write down first an initial-impression guess of about what the answer should be — say, that “37 + 42” should be a number somewhere around 80 — and then an exact answer, then that would be consistent with what I understand Common Core techniques encourage and a pretty solid approach. In Rick Kirkman and Jerry Scott’s Baby Blues for the 22nd Hammie offers multiple answers to each mathematics problem. “I like to increase my odds,” he says. For arithmetic problems, that’s not really helping. But it is often useful, especially in modeling complicated systems, to work out multiple answers. If you’re not sure how something should behave, and it’s troublesome to run experiments, then try develop several different models. If the models all describe similar behavior, then, good! It’s reason to believe you’re probably right, or at least close to right. If the models disagree about their conclusions then you need information. You need experimental results. The ways your models disagree can inspire new experiments. Mark Leiknes’s Cow and Boy rerun for the 22nd is another with one of the standard jokes you can make about fractions. I suspect I’ve featured this before too, but I quite like Cow and Boy . It’s sad that the strip was cancelled, and couldn’t make a go of it as web comic. I’m not surprised; the strip had so many running jokes it might as well have had a deer and an orca shooting rocket-propelled grenades at new readers. But it’s grand seeing the many, many, many running jokes as they were first established. This is part of the sequence in which Billy, the Boy of the title, discovers there’s another kid named Billy in the class, quickly dubbed Smart Billy for reasons the strip makes clear. I’m down to the last seven letters in the Leap Day 2016 A To Z. It’s also the next-to-the-last of Gaurish’s requests. This was a fun one. Take a huge bag and stuff all the real numbers into it. Give the bag a good solid shaking. Stir up all the numbers until they’re thoroughly mixed. Reach in and grab just the one. There you go: you’ve got a transcendental number. Enjoy! OK, I detect some grumbling out there. The first is that you tried doing this in your head because you somehow don’t have a bag large enough to hold all the real numbers. And you imagined pulling out some number like “2” or “37” or maybe “one-half”. And you may not be exactly sure what a transcendental number is. But you’re confident the strangest number you extracted, “minus 8”, isn’t it. And you’re right. None of those are transcendental numbers. I regret saying this, but that’s your own fault. You’re lousy at picking random numbers from your head. So am I. We all are. Don’t believe me? Think of a positive whole number. I predict you probably picked something between 1 and 10. Almost surely something between 1 and 100. Surely something less than 10,000. You didn’t even consider picking something between 10,012,002,214,473,325,937,775 and 10,012,002,214,473,325,937,785. Challenged to pick a number, people will select nice and familiar ones. The nice familiar numbers happen not to be transcendental. I detect some secondary grumbling there. Somebody picked π. And someone else picked e. Very good. Those are transcendental numbers. They’re also nice familiar numbers, at least to people who like mathematics a lot. So they attract attention. Still haven’t said what they are. What they are traces back, of course, to polynomials. Take a polynomial that’s got one variable, which we call ‘x’ because we don’t want to be difficult. Suppose that all the coefficients of the polynomial, the constant numbers we presumably know or could find out, are integers. What are the roots of the polynomial? That is, for what values of x is the polynomial a complicated way of writing ‘zero’? For example, try the polynomial x2 – 6x + 5. If x = 1, then that polynomial is equal to zero. If x = 5, the polynomial’s equal to zero. Or how about the polynomial x2 + 4x + 4? That’s equal to zero if x is equal to -2. So a polynomial with integer coefficients can certainly have positive and negative integers as roots. How about the polynomial 2x – 3? Yes, that is so a polynomial. This is almost easy. That’s equal to zero if x = 3/2. How about the polynomial (2x – 3)(4x + 5)(6x – 7)? It’s my polynomial and I want to write it so it’s easy to find the roots. That polynomial will be zero if x = 3/2, or if x = -5/4, or if x = 7/6. So a polynomial with integer coefficients can have positive and negative rational numbers as roots. How about the polynomial x2 – 2? That’s equal to zero if x is the square root of 2, about 1.414. It’s also equal to zero if x is minus the square root of 2, about -1.414. And the square root of 2 is irrational. So we can certainly have irrational numbers as roots. So if we can have whole numbers, and rational numbers, and irrational numbers as roots, how can there be anything else? Yes, complex numbers, I see you raising your hand there. We’re not talking about complex numbers just now. Only real numbers. It isn’t hard to work out why we can get any whole number, positive or negative, from a polynomial with integer coefficients. Or why we can get any rational number. The irrationals, though … it turns out we can only get some of them this way. We can get square roots and cube roots and fourth roots and all that. We can get combinations of those. But we can’t get everything. There are irrational numbers that are there but that even polynomials can’t reach. It’s all right to be surprised. It’s a surprising result. Maybe even unsettling. Transcendental numbers have something peculiar about them. The 19th Century French mathematician Joseph Liouville first proved the things must exist, in 1844. (He used continued fractions to show there must be such things.) It would be seven years later that he gave an example of one in nice, easy-to-understand decimals. This is the number 0.110 001 000 000 000 000 000 001 000 000 (et cetera). This number is zero almost everywhere. But there’s a 1 in the n-th digit past the decimal if n is the factorial of some number. That is, 1! is 1, so the 1st digit past the decimal is a 1. 2! is 2, so the 2nd digit past the decimal is a 1. 3! is 6, so the 6th digit past the decimal is a 1. 4! is 24, so the 24th digit past the decimal is a 1. The next 1 will appear in spot number 5!, which is 120. After that, 6! is 720 so we wait for the 720th digit to be 1 again. And what is this Liouville number 0.110 001 000 000 000 000 000 001 000 000 (et cetera) used for, besides showing that a transcendental number exists? Not a thing. It’s of no other interest. And this plagued the transcendental numbers until 1873. The only examples anyone had of transcendental numbers were ones built to show that they existed. In 1873 Charles Hermite showed finally that e, the base of the natural logarithm, was transcendental. e is a much more interesting number; we have reasons to care about it. Every exponential growth or decay or oscillating process has e lurking in it somewhere. In 1882 Ferdinand von Lindemann showed that π was transcendental, and that’s an even more interesting number. That bit about π has interesting implications. One goes back to the ancient Greeks. Is it possible, using straightedge and compass, to create a square that’s exactly the same size as a given circle? This is equivalent to saying, if I give you a line segment, can you create another line segment that’s exactly the square root of π times as long? This geometric problem is equivalent to an algebraic one. That problem: can you create a polynomial, with integer coefficients, that has the square root of π as a root? (WARNING: I’m skipping some important points for the sake of clarity. DO NOT attempt to use this to pass your thesis defense without putting those points back in.) We want the square root of π because … well, what’s the area of a square whose sides are the square root of π long? That’s right. So we start with a line segment that’s equal to the radius of the circle and we can do that, surely. Once we have the radius, can’t we make a line that’s the square root of π times the radius, and from that make a square with area exactly π times the radius squared? Since π is transcendental, then, no. We can’t. Sorry. One of the great problems of ancient mathematics, and one that still has the power to attract the casual mathematician, got its final answer in 1882. Georg Cantor is a name even non-mathematicians might recognize. He showed there have to be some infinite sets bigger than others, and that there must be more real numbers than there are rational numbers. Four years after showing that, he proved there are as many transcendental numbers as there are real numbers. They’re everywhere. They permeate the real numbers so much that we can understand the real numbers as the transcendental numbers plus some dust. They’re almost the dark matter of mathematics. We don’t actually know all that many of them. Wolfram MathWorld has a table listing numbers proven to be transcendental, and the fact we can list that on a single web page is remarkable. Some of them are large sets of numbers, yes, like for every positive whole number d. And we can infer many more from them; if π is transcendental then so is 2π, and so is 5π, and so is -20.38π, and so on. But the table of numbers proven to be irrational is still just 25 rows long. There are even mysteries about obvious numbers. π is transcendental. So is e. We know that at least one of π times e and π plus e is transcendental. Perhaps both are. We don’t know which one is, or if both are. We don’t know whether ππ is transcendental. We don’t know whether ee is, either. Don’t even ask if πe is. How, by the way, does this fit with my claim that everything in mathematics is polynomials? — Well, we found these numbers in the first place by looking at polynomials. The set is defined, even to this day, by how a particular kind of polynomial can’t reach them. Thinking about a particular kind of polynomial makes visible this interesting set. I discussed continued fractions recently, and with some controversy. So I imagine people might be interested in another view. Friday’s post on the MathsByAGirl blog is on the subject. Continued fractions get more discussion than I offered about how to represent them, and what those representations might tell us. My love and I saw Only Yesterday recently. It’s a 1991 Studio Ghibli film, directed by Isao Takahata. It hasn’t had a United States release before, which is a pity; it’s quite good. The movie is about a woman, Taeko, reflecting on her childhood as she considers changing her life. One of the many wonderfully-realized scenes is about ten-year-old Taeko’s struggles with arithmetic. You probably guessed that, as otherwise the movie would seem outside the remit of this blog. In the scene Taeko has had a disastrous arithmetic test. Her older sister is trying to coach her through how to divide fractions. It goes lousy. Her older sister insists it’s just a matter of inverting and multiplying. This is a useful tip if you understand how to divide fractions and need to keep straight what you’re doing. If you don’t understand, then it’s whatever the modern equivalent is for instructions on how to set a VCR. Taeko tries to understand one problem. . She pictures it as an apple and draws a circle, blacking out a third of it. She cuts the rest into four equally-sized pieces and concludes that you could fit six slices into the original apple. Her sister stammers over this and fumes. She declares “that’s multiplication!”. She complains her sister isn’t doing the right thing, she’s not inverting and multiplying. I recognize her sister’s panic. It’s the bluster of someone trying to explain something not actually understood, on watching someone going far off the script. The scene’s filled with irony. Taeko has a better understanding of what she’s doing than her sister has, but never knows it. Her sister understands a procedure but not what fractions dividing signifies. She can’t say why one wants to invert anything or multiply something. Taeko knows what the question she’s asked means, but not how to relate that to what she’s asked to do. I don’t want to undervalue learning procedures. They’re worth knowing. They are, once you master them, efficient ways to compute. But there are many ways to master a procedure. I can’t believe there is one way to learn anything that works for everyone. One of many challenges teachers face is exploring the different ways their students best learn. Another is getting close enough to how they best learn that most of the students can understand something. It’s a pity when real people akin to Taeko can’t get that little bridge to connect their drawings of an apple to the page of fractions to be worked out. 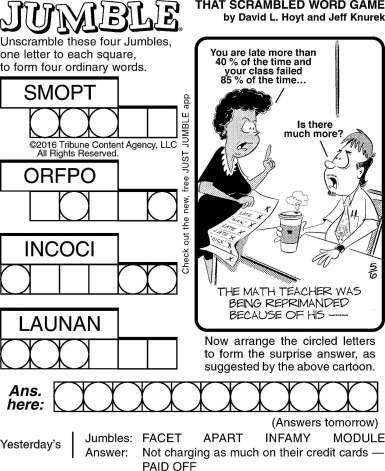 This week Comic Strip Master Command ordered the mention of some of the more familiar bits of mathematical-premise stock that aren’t students resisting word problems. This happens sometimes. Rick Stromoski’s Soup to Nutz for the 18th of February	finds a fresh joke in the infinite-monkeys problem. Well, it uses a thousand monkeys here, but that hardly matters. If you had one long-enough-lived monkey at the typewriter, in principle, we could expect them to type the works of Shakespeare. It’s how long it takes that changes. In practice, it’s going to be too long to wait for anyway. I wonder if the monkeys will ever get computers to replace their typewriters. Carol Lay’s Lay Lines for the 19th finds a fresh joke in Zeno’s Paradoxes. Lay particularly uses the most famous of Zeno’s Paradoxes. That’s the one about not being able to get anywhere because you have to get halfway there first, and halfway to that, in infinite regression. The other of Zeno’s Paradoxes that anyone who hasn’t just read the Wikipedia article on them can remember is Achilles and the Tortoise. It’s the question of how one can catch up to something. By the time you get to where the thing ahead of you is now, it’s gotten farther ahead still. And it does so again, in infinite regression. The third of the Paradoxes is about motion, depicted here as an arrow trying to fly through the air. Allow that speed is the distance travelled versus the time it takes to travel. But suppose time can be divided into infinitesimally tiny units. Then the distance the arrow travels in that time will also be infinitesimally tiny. So how can its speed have any meaningful definition? And the last is a hard-to-follow thing about three rods moving relative one another. I don’t feel confident describing it because I only intermittently feel like I understand what the paradox is getting at. I believe it’s supposed to be a problem with understanding how speeds can add together. Anyway, the point of the paradoxes is not something as trite as “silly Ancient Greeks didn’t understand calculus”. They had an awfully good understanding of what makes calculus work. The point is that either space and time are infinitely divisible or else they aren’t. Either possibility has consequences that challenge our intuitions of how space and time should work. Dave Blazek’s Loose Parts for the 19th	uses scientific notation. It’s a popular way to represent large (and small) numbers. It’s built on the idea that there are two interesting parts to a number: about how big it is, and what its leading values are. We use some base, nearly always 10, raised to a power to represent how big the number is. And we use the rest, a number between 1 and whatever the base is, to represent the leading values. Blazek’s channel 3 x 103 is just channel 3000, though. My satellite TV package has channels numbering from 6 up through 9999, although not all of them. Many are empty. Still, it would be a more excessive number of options if he were on channel 3 x 106, or 3,000,000. Russell Myers’s Broom Hilda for the 22nd	shows Nerwin trying to learn addition by using a real-world model. I tend to be willing to let people use whatever tool they find works to learn something. But any learning aid has its limits, and trying to get around them can be challenging, or just creepy. Dave Whamond’s Reality Check for the 22nd	is another version of that rounding-up joke that’s gone around Comic Strip Master Command, and your friends’ Facebook timelines, several times now. Well, I enjoy how suspicious the sheep up front are. Rick Kirkman and Jerry Scott’s Baby Blues for the 23rd of February, 2016. You know, that’s an awfully tiny mirror above the keys. There’s no way Wanda and Darryl can even see their whole faces in it. Rick Kirkman and Jerry Scott’s Baby Blues for the 23rd	I include mostly because I wanted some pictures to include here. But mathematics is always a reliable choice when one needs scary school work to do. And I grant that fraction are particularly unsettling. There is something exotic in being told 1/2 is much bigger than 1/6, when one knows that 2 is so much smaller than 6. And just when one’s gotten comfortable with that, someone has you subtract one fraction from another. In the olden days of sailors and shipping, the pay for a ship’s crew would be in shares of the take of the whole venture. The story I have read, but which I am not experienced enough to verify, depends on not understanding fractions. Naive sailors would demand rather than the offered 96th (or whatever) share of the revenues a 100th or 150th or even bigger numbers. Paymasters would pretend to struggle with before assenting to. Perhaps it’s so. Not understanding finance is as old as finance. But it does also feel like a legend designed to answer the question of when will someone need to know mathematics anyway. David L Hoyt and Jeff Knurek’s Jumble for the 24th of February, 2016. The link will likely expire in late March. The third scrambled word reveals to me that ‘nebing’ is totally a word that some science fiction project should be able to use. David L Hoyt and Jeff Knurek’s Jumble for the 24th	is not necessarily a mathematics comic. It could be philosophy or theology or possibly some other fields. Still, I imagine you can have fun working this out even if the final surprise-answer jumped out at me before I looked at the other words. This has got me closer to the number of comics I like for a Reading the Comics post. There’s two comics already in my file, for the 14th of December, but those can wait until later in the week. David L Hoyt and Jeff Knurek’s Jumble for the 11th of December has a mathematics topic. The quotes in the final answer are the hint that it’s a bit of wordplay. The mention of “subtraction” is a hint. David L Hoyt and Jeff Knurek’s Jumble for the 11th of December, 2015. The link will probably expire in mid-January 2016. Also somehow I’m writing about 2016 being in the imminent future. Brian Kliban’s cartoon for the 11th of December (a rerun from who knows when) promises an Illegal Cube Den, and delivers. I’m just delighted by the silliness of it all. Greg Evans’s Luann Againn for the 11th of December reprints the 1987 Luann . “Geometric principles of equitorial [sic] astronomical coordinate systems” gets mentioned as a math-or-physics-sounding complicated thing to do. The basic idea is to tell where things are in the sky, as we see them from the surface of the Earth. In an equatorial coordinate system we imagine — we project — where the plane of the equator is, and we can measure things as north or south of that plane. (North is on the same side that the Earth’s north pole is.) That celestial equator is functionally equivalent to longitude, although it’s called declination. We also need something functionally equivalent to longitude; that’s called the right ascension. To define that, we need something that works like the prime meridian. Projecting the actual prime meridian out to the stars doesn’t work. The prime meridian is spinning every 24 hours and we can’t publish updated star charts that quickly. What we use as a reference meridian instead is spring. That is, it’s where the path of the sun in the sky crosses the celestial equator in March and the (northern hemisphere) spring. There are catches and subtleties, which is why this makes for a good research project. The biggest one is that this crossing point changes over time. This is because the Earth’s orbit around the sun changes. So right ascensions of points change a little every year. So when we give coordinates, we have to say in which system, and which reference year. 2000 is a popular one these days, but its time will pass. 1950 and 1900 were popular in their generations. It’s boring but not hard to convert between these reference dates. And if you need this much precision, it’s not hard to convert between the reference year of 2000 and the present year. I understand many telescopes will do that automatically. I don’t know directly because I have little telescope experience, and I couldn’t even swear I had seen a meteor until 2013. In fairness, I grew up in New Jersey, so with the light pollution I was lucky to see night sky. Peter Maresca’s Origins of the Sunday Comics for the 11th of December showcases a strip from 1914. That, Clare Victor Dwiggins’s District School for the 12th of April, 1914, is just a bunch of silly vignettes. It’s worth zooming in to look at. 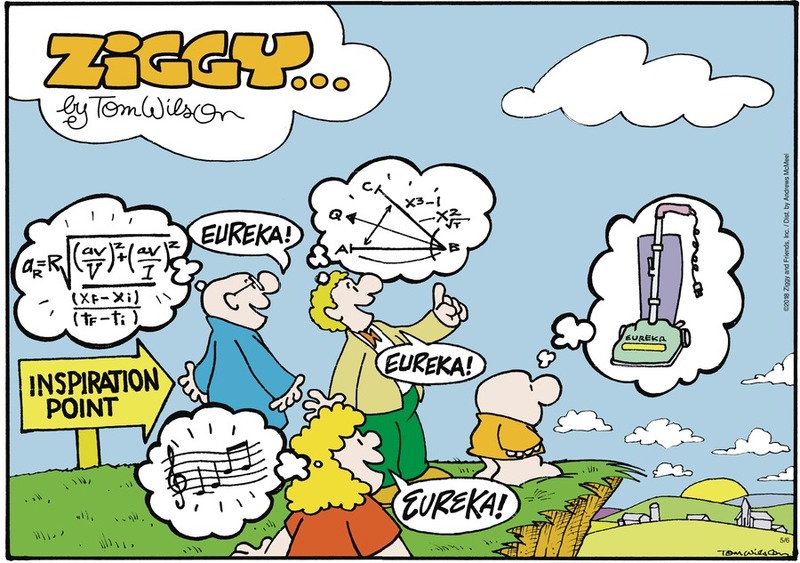 It’s got a student going “figger juggling” and that gives me an excuse to point out the strip to anyone who’ll listen. Samson’s Dark Side of the Horse for the 13th of December enters another counting-sheep joke into the ranks. Tying it into angles is cute. It’s tricky to estimate angles by sight. I think people tend to over-estimate how big an angle is when it’s around fifteen or twenty degrees. 45 degrees is easy enough to tell by sight. But for angles smaller than that, I tend to estimate angles by taking the number I think it is and cutting it in half, and I get closer to correct. I’m sure other people use a similar trick. Brian Anderson’s Dog Eat Doug for the 13th of December has the dog, Sophie, deploy a lot of fraction talk to confuse a cookie out of Doug. A lot of new fields of mathematics are like that the first time you encounter them. I am curious where Sophie’s reasoning would have led, if not interrupted. How much cookie might she have cadged by the judicious splitting of halves and quarters and, perhaps, eighths and such? I’m not sure where her patter was going. Shannon Wheeler’s Too Much Coffee Man for the 13th of December uses the traditional blackboard full of symbols to denote a lot of deeply considered thinking. Did you spot the error? And now, I think, I’ve got caught up on the mathematics-themed comics that appeared at Comics Kingdom and at Gocomics.com over the past week and a half. I’m sorry to say today’s entries don’t get to be about as rich a set of topics as the previous bunch’s, but on the other hand, there’s a couple Comics Kingdom strips that I feel comfortable using as images, so there’s that. And come to think of it, none of them involve the setup of a teacher asking a student in class a word problem, so that’s different. Mason Mastroianni, Mick Mastroianni, and Perri Hart’s B.C. (February 21)	tells the old joke about how much of fractions someone understands. To me the canonical version of the joke was a Sydney Harris panel in which one teacher complains that five-thirds of the class doesn’t understand a word she says about fractions, but it’s all the same gag. I’m a touch amused that three and five turn up in this version of the joke too. That probably reflects writing necessity — especially for this B.C. the numbers have to be a pair that obviously doesn’t give you one-half — and that, somehow, odd numbers seem to read as funnier than even ones. Bud Fisher’s Mutt and Jeff (February 21)	decimates one of the old work-rate problems, this one about how long it takes a group of people to eat a pot roast. It was surely an old joke even when this comic first appeared (and I can’t tell you when it was; Gocomics.com’s reruns have been a mixed bunch of 1940s and 1950s ones, but they don’t say when the original run date was), but the spread across five panels treats the joke well as it’s able to be presented as a fuller stage-ready sketch. Modern comic strips value an efficiently told, minimalist joke, but pacing and minor punch lines (“some men don’t eat as fast as others”) add their charm to a comic. I’m still getting back to normal after the Christmas and New Year’s disruption of, well, everything, which is why I’m taking it easy and just doing another comics review. 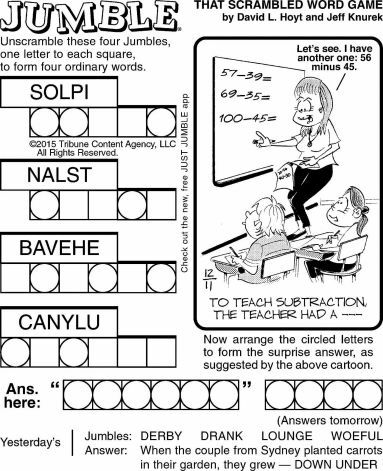 I have to suppose Comic Strip Master Command was also taking it easy over the holidays since most of the subjects are routine genres — word answer problems, mathematics-connected puns, and the like — with the Bloom County reruns the cartoons that give me most to write about. It’s all part of the wondrous cycle of nature; I’m sure there’ll be a really meaty collection of topics along soon. Gordon Bess’s Redeye for the 8th of January, 2015; originally run the 21st of August, 1968. Reading the Comics, December 30, 2014: Surely This Is It For The Year Edition? Well, I thought it’d be unlikely to get too many more mathematics comics before the end of the year, but Comic Strip Master Command apparently sent out orders to clear out the backlog before the new calendar year starts. I think Dark Side of the Horse is my favorite of the strips, blending a good joke with appealing artwork, although The Buckets gives me the most to talk about. Greg Cravens’s The Buckets (December 28)	is about what might seem only loosely a mathematical topic: that the calendar is really a pretty screwy creation. And it is, as anyone who’s tried to program a computer to show dates has realized. The core problem, I suppose, is that the calendar tries to meet several goals simultaneously: it’s supposed to use our 24-hour days to keep track of the astronomical year, which is an approximation to the cycle of seasons of the year, and there’s not a whole number of days in a year. It’s also supposed to be used to track short-term events (weeks) and medium-term events (months and seasons). The number of days that best approximate the year, 365 and 366, aren’t numbers that lend themselves to many useful arrangements. The months try to divide that 365 or 366 reasonably uniformly, with historial artifacts that can be traced back to the Roman calendar was just an unspeakable mess; and, something rarely appreciated, the calendar also has to make sure that the date of Easter is something reasonable. And, of course, any reforming of the calendar has to be done with the agreement of a wide swath of the world simultaneously. Given all these constraints it’s probably remarkable that it’s only as messed up as it is. To the best of my knowledge, January starts the New Year because Tarquin Priscus, King of Rome from 616 – 579 BC, found that convenient after he did some calendar-rejiggering (particularly, swapping the order of February and January), though I don’t know why he thought that particularly convenient. New Years have appeared all over the calendar year, though, with the start of January, the start of September, Christmas Day, and the 25th of March being popular options, and if you think it’s messed up to have a new year start midweek, think about having a new year start in the middle of late March. It all could be worse. Author Joseph NebusPosted on Tuesday, 30 December, 2014 Categories Comic Strips, Math, Mathematics, MathsTags abacus, calendars, Comic Strip Master Command, expressions, fractions, measurement, numerals, pi, Rome, state legislatures, Y2K4 Comments on Reading the Comics, December 30, 2014: Surely This Is It For The Year Edition? My spouse, the professional philosopher, was sharing some of the engagingly wrong student responses. I hope it hasn’t shocked you to learn your instructors do this, but, if you got something wrong in an amusing way, and it was easy to find someone to commiserate with, yes, they said something. The particular point this time was about Plato’s Analogy of the Divided Line, part of a Socratic dialogue that tries to classify the different kinds of knowledge. I’m not informed enough to describe fairly the point Plato was getting at, but the mathematics is plain enough. It starts with a line segment that gets divided into two unequal parts; each of the two parts is then divided into parts of the same proportion. Why this has to be I’m not sure (my understanding is it’s not clear exactly why Plato thought it important they be unequal parts), although it has got the interesting side effect of making exactly two of the four line segments of equal length.